In recent weeks we have spoken about different types of mortgage rates that are making now a perfect time to buy or refinance your current home. This week we will focus in on FHA Streamline Refinancing. The FHA Streamline Refinance is a special mortgage product that is reserved for homeowners with existing FHA mortgages. This type of refinance is the fastest, simplest way for an FHA-insured homeowner to refinance their respective mortgages with today’s mortgage rates. The FHA Streamline Refinance program’s defining characteristic is that it does not require a home appraisal. Instead, the FHA allows you to use your original purchase price as your current value, regardless of the value of your home in today’s market. The advantage of using your original value is that you are able to refinance your home without added cost or penalty. This program is developed and encourages underwater mortgages, allowing you to refinance even if you owe twice as much as your home is worth. The “appraisal waiver” has been a huge upturn for Florida homeowners, allowing unlimited loan-to-value home loans. Besides this “no appraisal” feature, the FHA Streamline Refinance behaves very similar to other loan products. It is available in adjustable and fixed mortgage rates, providing a 15 or 30-year term option with no FHA prepayment penalty to worry about. Another advantage to the FHA Streamline Refinance is that it holds the same rates as a regular FHA loan, even with carrying little to no equity on your home. Qualifying for the FHA Streamline Refinance program is fairly easy because of three main reasons. Earlier this decade, in order to help U.S. homeowners, the FHA abolished most of the verification process required to obtain a mortgage. The first qualification they dismissed was the verification of employment that is required by most mortgage options. The next verification abolished was the income verification. You no longer will be asked to supply your monthly income to receive a FHA refinance. To help make it even easier to obtain the FHA Streamline Refinance, they also cancelled the verification of your personal credit score. By not having to get a home appraisal either, you can be: out of work, without income, carry a terrible credit rating, and have no home equity and still be approved for an FHA Streamline Refinance. This may sound crazy, but to understand why the FHA Streamline Refinance program is a smart program, we have to remember that the FHA’s main role is to insure mortgages, not make them. It is in the FHA’s best interest to help as many people as possible qualify for today’s low rates and pass over foreclosure and defaulting. Lower rates in turn leads to lower monthly payments, allowing more and more people able to make these payments and avoid defaults. This brings a strong promotion for homeowners to take advantage of this option, but in turn actually benefits the FHA more than homeowners. After hearing about the program, you now need to see if you are eligible for the program. The first way the FHA can reduce its overall loan pool risk is to verify that any applicant has a perfect, 3-month payment history. This meaning, that you have made payments on time for the past 3 months of your mortgage. One mortgage late payment is allowed in the last 12 months, but not in the past 90 days. The next step is that the FHA requires at least a 210-day “waiting period” between refinances. In other words, 6 mortgages payments must have been made on a homeowners current FHA–insured loan. Another check that the FHA does is to make sure there is a purpose behind the refinance. There must be a legitimate reason such as reducing the principle, interest, or mortgage insurance payments by 5 percent or more. Another Net Tangible Benefit is to refinance from an adjusting ARM into a fixed loan rate. Taking cash out to pay bills or buy other goods is not an acceptable reason for the FHA program. The last requirement to obtaining an FHA Streamline Refinance is that the FHA requires a homeowner to make two types of mortgage insurance payments. The first is an upfront mortgage insurance payment made at closing. The second payment is an annual payment made once per month with your mortgage payment. Homeowners using the FHA Streamline Refinance program are split into two classes. The first class consists of homeowners whose new loan replaces an FHA-backed mortgage endorsed prior to June 1, 2009. The second class is one that replaces the FHA-backed mortgage endorsed on or after June 1, 2009. The first class, which is before June 1, 2009 pays markedly lower mortgage insurance than the “new” FHA homeowners. 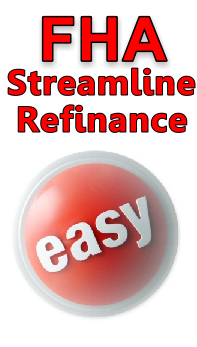 The FHA Streamline Refinance is among the easiest and best-valued mortgage products available. Plus, mortgage rates have dropped. If you have an existing FHA mortgage, get yourself a FHA Streamline Refinance rate quote. FHA mortgage rates are low and closings can occur in as few as 20 days. And, the faster you close, the bigger your FHA upfront mortgage insurance premium refund.